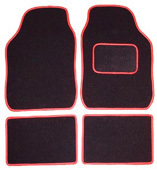 Car overmats can be made to order. Depending on the quality required prices can vary for a set from £20 up to £90. Available in standard black crumb back overmatting or in any of our car carpet ranges with a laminated rubber backing. If we do not have the pattern for your vehicle we can make them from paper templates sent in by the customer - please call our sales office on 01942 255535 or email us for more information.